L.B. Foster Automation decided to use Exclaimer Cloud - Signatures for Office 365 to get Office 365 signatures on all devices and maintain the consistency of its brand. L.B. Foster Automation is a consolidation of L.B. Foster urope’s Industrial Automation and Materials Handling businesses into a single, design, manufacturing and production ‘Centre of Excellence’ in Nottingham in the UK. The organization is responsible for designing, building and supplying systems and machines for a variety of production demands and works within a variety of different business verticals. I simply can’t fault Signatures for Office 365 or the fabulous support I received. The larger an organization is, the more difficult it becomes to design and manage professional email signatures, even when using Office 365. Enforcing a unified signature template for all users located in multiple office and/or geographic locations means utilizing numerous Transport Rules that were never designed for high-quality HTML Office 365 signatures. You cannot preview a template before it is implemented, signatures will not be added to reply/forwarded emails and the time it takes to accomplish this task often takes focus away from other important IT tasks. Administrators usually find using Transport Rules for email signature management a tedious task, which often facilitates the need for a third-party solution to make this simpler. This becomes even more necessary if mobile signatures are required as these are not possible managing Office 365 signatures manually. 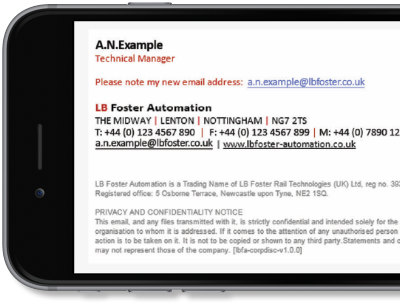 In an age when over 50% of all emails worldwide are opened on mobiles, an HTML mobile signature design has to look as professional as one on a desktop to maintain brand consistency.